Yesterday was just a regular Saturday here in Salvador, Brazil. We got back from the beach around 5, showered, had a snack. Oh, and then we made chocolate. You know, like you do on a Saturday night. It all started last weekend when we were out for a stroll. We passed a grocery store and noticed a new fruit. It was labeled cacau, and when I shook it (oh-so-gently, of course) it sounded hollow inside, like it might contain a pit with space around it. 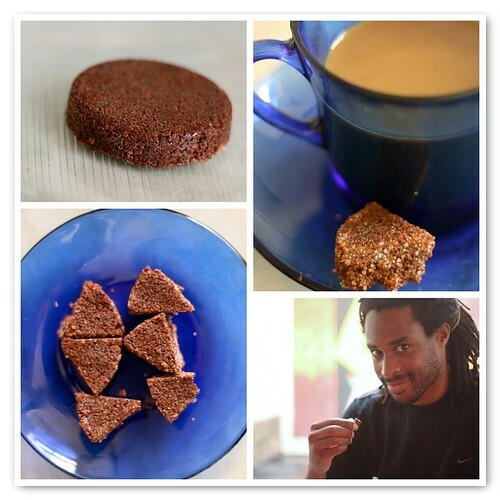 Ken speculated at the time that cacau might translate as cocoa, and later, the internets confirmed his suspicions. Cocoa! A.k.a., future chocolate! 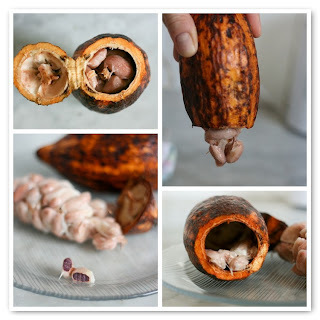 While I captured the cacau's outsides for posterity, Ken did some more research, and learned that not only are raw cocoa beans delicious and nutritious, an ambitious individual can use them to make chocolate at home. We are nothing if not ambitious. 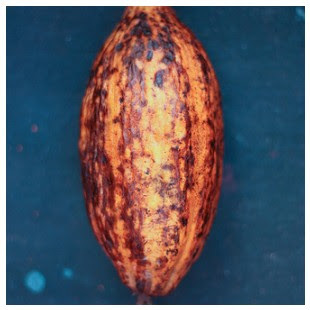 First, we cut off the end of the cocoa pod, and peered inside. It was like Alien in there. It looked really, really gross. 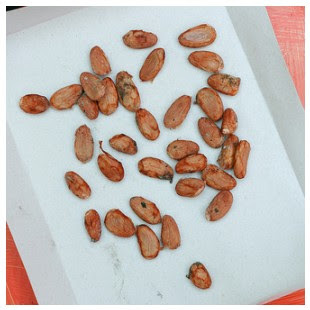 The beans were all held together by a sinewy pulp and came out of the pod as a cluster. A very unappetizing cluster. However, as I am 100% committed to FotD, I tried a bean. The pulp is tasty! It isn't chocolatey in the least, but it's sweet. The beans themselves taste kind of like raw coffee beans. They're a little bitter, but mostly inoffensive. And when you untangle a cocoa bean from all that pulp it's very pretty, and looks like a purple almond. We ate a couple of beans then wrapped the rest of the gooey, pulpy bunch in a rag to ferment. And ferment they did! There is no photographic evidence of fermentation, but after six days, that rag smelled good and fermented. Trust me. Next, we left them in the sun to dry while we went to the beach and ate beach-cheese and coconut popsicles. When we got home, we put the fermented, dried cocoa beans in the oven for about half an hour. The kitchen smelled shockingly like chocolate. Then we shelled them and had a bunch of cocoa nibs. Next up, grinding and conching. 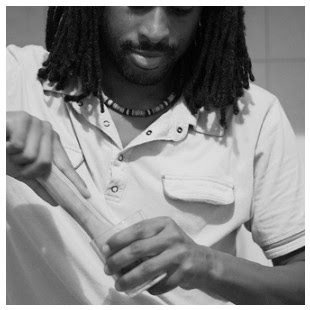 For the grinding step, we used a pestle (easily had, with all the caipirinha-making that goes on in these parts) with a clear glass mug, so we could see what was going on. We took turns grinding those beans until they finally started to look like butter. Cocoa butter! At this point they still tasted very bitter, but distinctly smelled like chocolate. Much Googling revealed that for the conching step we were going to need a fancy machine. We could only assume that people made chocolate before such fancy machines were invented, so we decided to skip that part and just mix in some sugar. Add sugar, taste, add sugar, taste... We added about 4-5 tsp of sugar to the cocoa from a single pod, and it was still pretty bitter, so your mileage may vary. 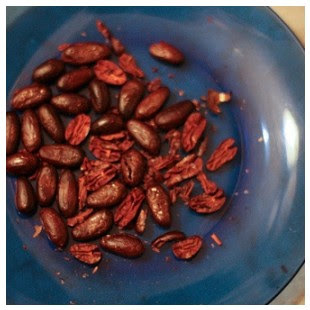 After adding sugar, we pressed our fermented, dried, roasted, ground, and sweetened cocoa beans into a ramekin. Ramekin might come from a Dutch word for "toast" or a German word for "little cream," but last night it was Portuguese for "chocolate mould." We then went out for bolinhos de bacalhau (fried cod balls (heh)) and a couple or three caipirinhas. Give or take. Today, Sunday, there was chocolate. We toasted the miraculous cacau fruit with a cup of the finest Brazilian coffee we could find. And we rejoiced. UFF Fruit Rating: , obviously. This fruit turns into CHOCOLATE. P.S. We mostly used the chocolate-making instructions here. They leave a lot of room for interpretation, which we like. The only thing we might have changed was our roasting time. The oven here is very hot (the minimum temperature is 200°C, or around 400°F), and we think we would have had even more delicious results if we'd roasted the beans for 10 minutes instead of 30.
really, really wishing i was there as taste tester. and the beach with cheese and coconut may seriously make salvador the next place i have to go. I have it on good authority that if you ordered cacau juice at a sucos centre, it is made from the pulpy stuff, and not from the seeds! Talk about using every part of the fruit! I did try cacau juice once, but it was mixed with morango and the cacau taste was well nigh indistinguishable.